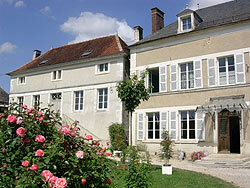 for up to 26 resident artists, Champs Mélisey is designed for creative learning, providing an immersion experience of the artist's life in France and an ideal setting for concentrated study and personal artistic development. In the typical charm that defines the Burgundy region, the quiet village of Mélisey lies hidden between two valleys, surrounded by vineyards and brooks, forests and farmland. 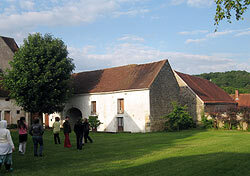 On the rocky hill that towers over the ancient lavoir (village water source surrounded by stone architecture used historically for washing clothes) stands the medieval church of Saint-Aventin. On the village square, the little maison du sabotier (clog maker) evokes the past while the local residents recount the festivities and balls that flourished there. The surrounding woods and footpaths invite you to wander and explore. The stone from which most of the village houses are constructed provides a unity of character to the local architecture. 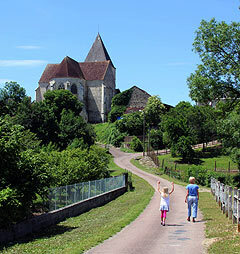 Pilgrims en route to Saint-Jacques de Compostelle crossing through Mélisey often stop to take in the peacefulness of this little village in the region of Tonnerre. 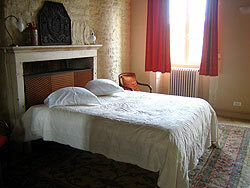 Mélisey means a thousand sources, and Les Champs Mélisey, located at the entrance to the village, provides a serene retreat where artists find inspiration and calm. Les Champs Mélisey has become known locally as a source of artistic creation and an exciting place to attend performances made by artists from all over the world. Drawing its audience from dozens of neighboring villages and towns, Les Champs Mélisey is a true beacon of cultural and artistic exchange.